Remembrance Day Services. November, Sunday 11. We encourage all off duty Local 1212 Members both past and present to participate in a Remembrance Day Service, here in Mississauga or in your home community. 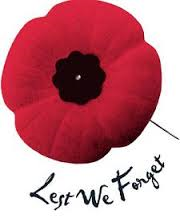 Dates and times of some Mississauga Remembrance Day parades and services are listed below. Mississauga's Royal Canadian Legion Branches will host distinguished veterans, Canadian Forces personnel, Legion members, emergency service workers, community groups and civic leaders honouring our veterans both past and present for their valour and sacrifice to Canada and all Canadians.